Sometime a year or so ago I came across this website when searching for Hungarian paganism and one of their pages is about a magical stag that’s been incorporated into Hungarian mythology. A Scythian stag the State Hermitage Museum in St. Petersburg, Russia. Dated from the 7th century B.C. from the Northern Caucasus. Image obtained from http://www.azerbaijanrugs.com/. The stag artifacts and idea, for some reason, sparked an interest in me and I’ve been trying to dig up information on it since then. I could not tell back then if the website linked above was accurate or not, since the story of the “wondrous stag” is a children’s book on amazon.com. 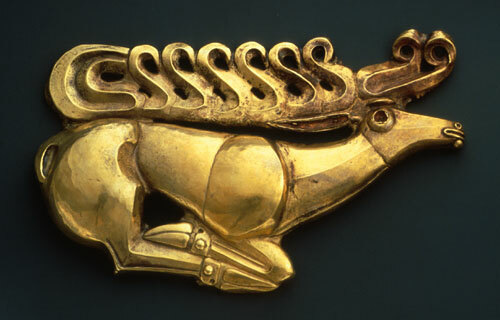 However, the site is correct on the prominence of the stag imagery in Scythian and neighboring cultures. There’s a whole book on this that is unfortunately out of print: The Deer Goddess of Ancient Siberia: A Study in the Ecology of Belief by Esther Jacobson (another dissertation book, aren’t they great?). But fear not, for I have found one in a nearby library! Now I know the title says “Siberia”, but the book goes into more Western ranges of the Scythians and the cultures they interacted with. Indeed, archaeological remains of Scythian culture, including the deer imagery, have been found in Central Europe a well. This is probably why they are considered to be relevant peoples in contemporary Hungarian culture, which explains the website. Much of the book focuses on the Siberian peoples, with some Scythian-specific examples inserted here and there in a comparative analysis. Strikingly, there is a commonality in the image of the deer, often antlered and female, being associated with the duality of life and death with both human and other animal figures. Humans, wolves, and big cats are often depicted as the hunters of an antlered doe, presumably to coincide with that “life-death” duality. Sometimes the symbols go so far as to all be combined into one figure. A stag base, but with paws in place of hoofs, a long cat tail, a beak instead of a muzzle, and antlers becoming birds; these variations have all been seen in Scytho-Siberian artifacts. Perhaps as a result, or because of, these associations, the doe is also connected to the “Tree of Life” concept found in many cultures throughout Eurasia (including Central European ones). On a simple level it is not hard to imagine the branching antlers as a deciduous tree, and some items depicting a stag-like figure also include leaves or birds in the antlers, as if they were trees. But on a deeper level this also gives suggestions to the role of the doe in human life and death situations. She’s a creator, and a reaper, guiding the souls throughout the major life stages. She is a guide to the various levels of the tree for the shamans (I’m referring to the specific religious/cultural role found in some Siberian cultures, also spelled saman in English). This has also been attested in Vitebsky’s The Reindeer People: Living with Animals and Spirits in Siberia, that a shaman may ride a reindeer to the different realms (also a common folktale motif in Eurasia). Deer in general are an ancient target for human hunters, and the Antlered Doe is aware of that. Sometimes she acts as an Animal Mother, with hunters and shamans appealing to her for available game. Sometimes the men even have to sleep with her in order for anything useful to happen (who says folklore is for children?). It’s less clear on female relationships with the Antlered Doe, most likely because female relationships get less screentime than male ones in history. But they’re there, with women giving offerings and participating in rituals in various ways. Given that women were generally the keepers of the hearth in many Eurasian cultures (including Siberians), and therefore the family, the fact that the Antlered Doe had clan totem associations means that women must have had something special to do with her. A final major attribute of the Antlered Doe is her association with heavenly bodies, particularly the Sun. This is the one seen in Hungarian as an old Christmas carol, where the Doe is the mother or the keeper of the Sun, holding it in her antlers. A form of the Hungarian “tree of life” is a tree growing out of a horse or deer skull, as I mentioned in a previous post. The Sun and Moon are nestled among the antler-like branches. This connection to the Sun, primarily, and the Moon is common in Siberian stories as well. Clearly a being of great importance. In addition to the Scythian and Siberian deer imagery there are also folktales speaking of a white, golden-horned deer, chamois or ram in the Austrian and Slovenian Alps, my “ancestral home range”. Now I do not have research available to see if there is a deep connection to the Siberian antlered doe, but the folklore have similar roles/powers and storylines as the antlered doe tends to have. These golden-horned caprids are representational beings of the forest and mountains, with supernatural powers, and they often lead the hunters on an unforgettable chase that changes their lives forever. We can also see deer in general being special representatives or symbols of wild places in all sorts of folktales, including Celtic. There they are the steeds of fairies and “magical” folk, like the dwarves in Disney’s 1937 Snow White and the Seven Dwarves. There is even a deer Goddess (name varies) in the UK that is often depicted with antlers, thought to have originated from Northern European tribes (maybe Celtic). Similar to Siberian associations, this deer goddess is connected to the reindeer, as that is a species where females also have prominent antlers. Occasionally females of other deer species develop antlers as well, though not on a regular basis. So the Antlered Doe concept is not pure fantasy. Given that we see this magical deer motif as a character in movies like Princess Mononoke and the recent Snow White and the Huntsman, and in games like Pokemon: Black and White (the deer Pokemon Sawsbuck), this type of figure still retains importance, albeit symbolically as a spirit of the forests. White animals in particular are still regarded as special, and often protected by laws and by the locals even in supposedly secular countries like the USA. If nothing else, these sacred beings are a reminder of what we have to lose should ecosystems continue to be broken by human development. As an ecologist and a pagan I am inspired by the Antlered Doe in my work to understand the wilds and help protect them. Her prominence in modern media shows that many others feel similarly, and that gives me hope. Vitebsky, Piers. (2005). The Reindeer People: Living with Animals and Spirits in Siberia. Mariner Books.